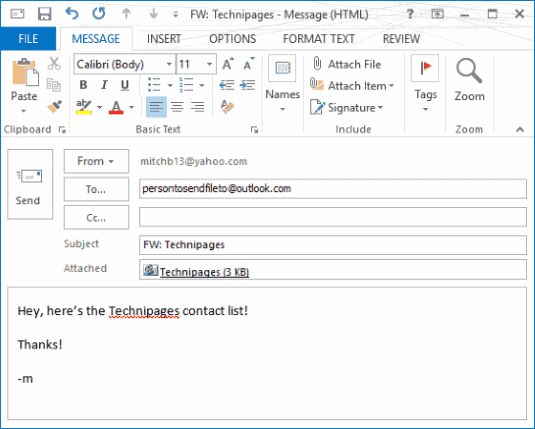 If you have created a local contact list (otherwise known as a distribution list) in Microsoft Outlook 2016 or 2013, you may want to share it by sending it to someone else. Here’s how you can send a contact list to another Outlook user. Select the “Home” tab, then open the “Address Book“. You can also open the Address Book by pressing “CTRL” + “SHIFT” + “B“. Open the contact list you wish to share. While under the “Contact Group” tab, select the “Forward Group” option. In most cases you can choose “As an Outlook Contact“. If the person you are sending the list to is a non-Outlook user, you may want to use “In Internet Format (vCard)“. An email is created with the contact list attached. Compose your message, then send it off. Once the user receives it, they can simply drag the file attachment from the email to “People” at the bottom of their screen to save it to their contacts. 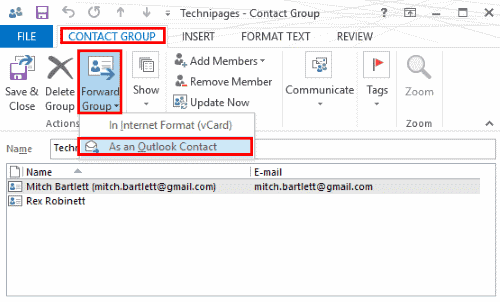 See “Outlook 2016 & 2013: Import Contact Group List” for more options. Does this method only work in the desktop “client” version of Outlook (i.e., installed on your computer’s hard drive)? Or should it also work with Outlook Web Access (OWA)? I ask because it didn’t seem to work for me in OWA. I was able to send a Contact Group list to a co-worker (within my organization) who uses Outlook Web Access, So far so good. He could open the message, and he could drag and drop the Contact Group onto the People button. But then, when he tried to compose a new message and enter the Contact Group name, OWA didn’t show anything. The Contact Group also didn’t show up in his People folder. Any suggestions? Any likely explanations?